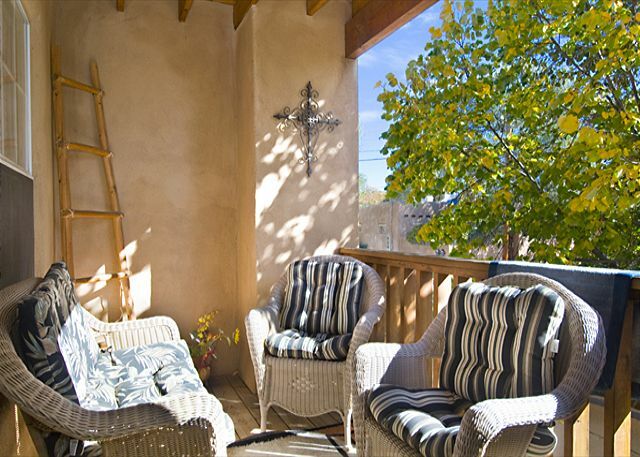 Perfect, cozy 3 bedroom 2 bath Santa Fe vacation rental located in the Railyard/Guadalupe neighborhood. 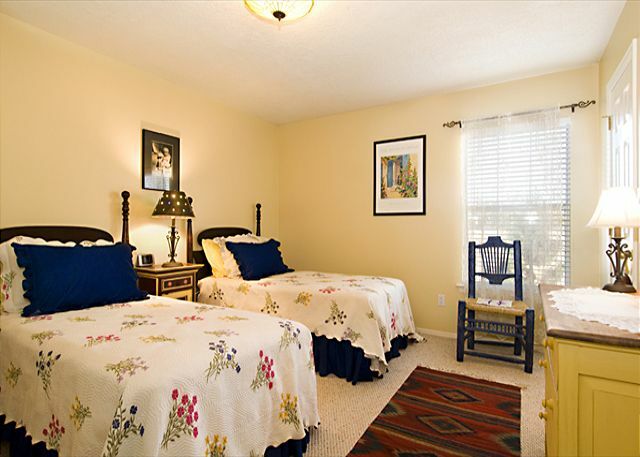 You will have “sweet dreams” in this well decorated townhome in a private, quiet compound. The living room is decorated with southwestern décor, art and comfy leather sofa and chairs. There is a flat screen TV with cable provided for your viewing pleasure, as well as a DVD player and stereo. Cuddle around the wood burning fireplace for cool winter evenings and enjoy a good book or movie. 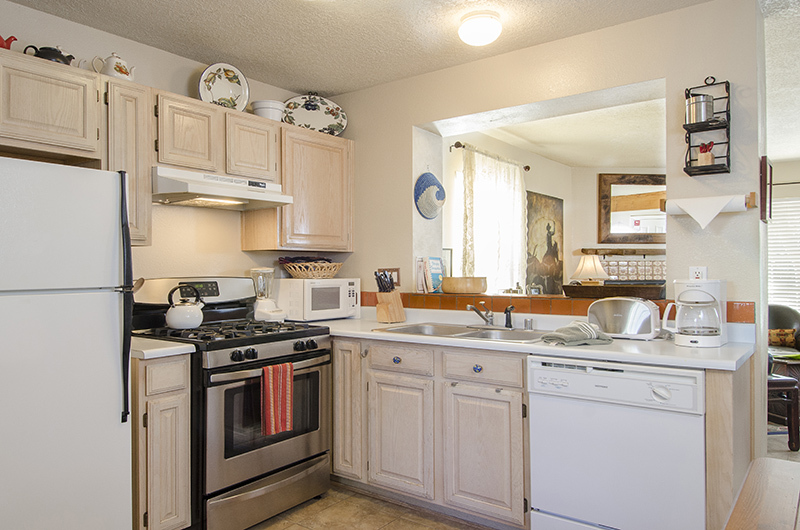 The well-equipped kitchen is small but has all the standard appliances as well as cookware to enjoy a relaxing home cooked meal with comfortable seating for six at the dining room table. There is a guest bedroom on the main level. This bedroom offers a queen bed, an IPod docking station and access to a full bathroom in the hall. The master bedroom and additional guest bedroom are upstairs and share a full sized bathroom as well as access to the private balcony perfect for enjoying morning coffee. The second guest room has twin beds perfect for the singles in your party, or if you prefer, our housekeeper can prepare this room with a king bed. The master bedroom has a king bed and a tube TV with cable access. For your outdoor dining, a private back patio with BBQ, table and chairs and chaise are provided for your enjoyment and relaxation. For those occasional warm Santa Fe evenings, this property has air conditioning. The compound offers onsite laundry room. Owner will consider one small dog. Townhouse was walkably close to the plaza and Railyard shopping. Having a main level bedroom and bath was perfect for Grandma. All furnishings were of a very high quality. Mattresses were very comfortable. New bathroom fixtures and kitchen appliances. 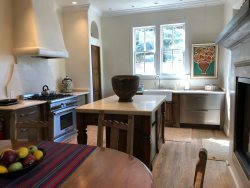 Beautiful Santa Fe styled decor throughout the home with many unique touches. This was a delightful place to make our first visit to Santa Fe very comfortable and enjoyable. Truly a home away from home! !